This is the tool for database activities related to comparables and contacts. 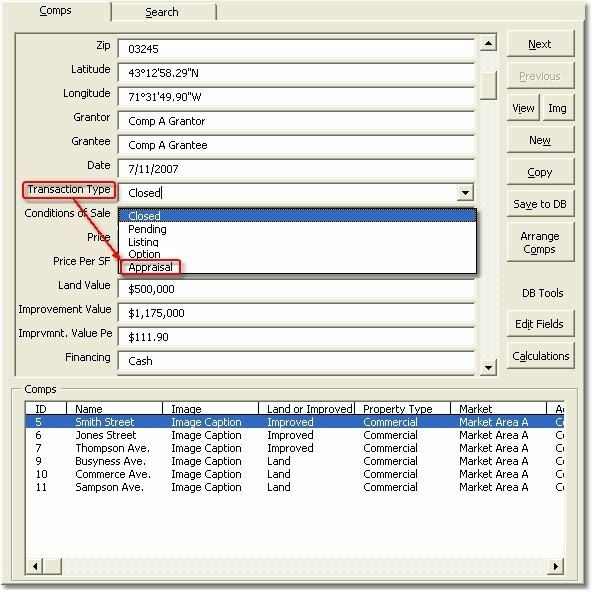 Run this tool from the adjustment grids to manage comparables, or from the File Info sheet, to manage contacts, clients, and/or appraisers. 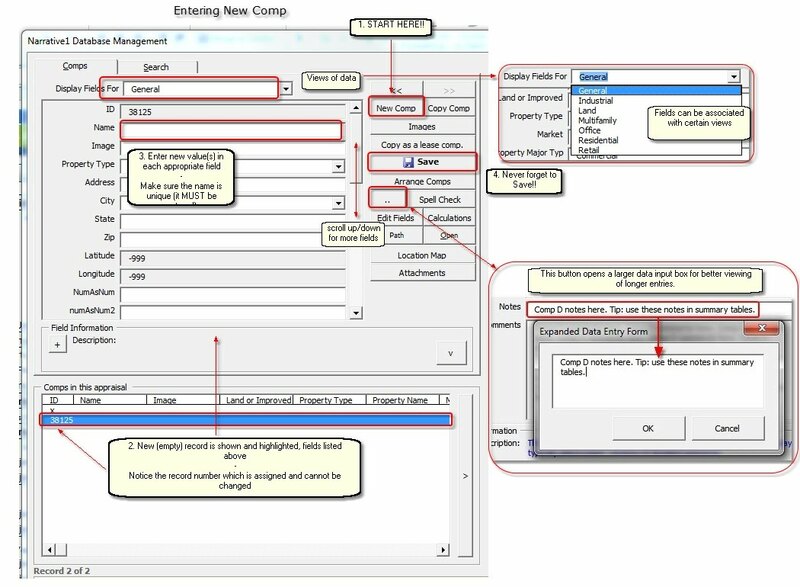 The following sections describe the functionality of the Comp Manager in detail. 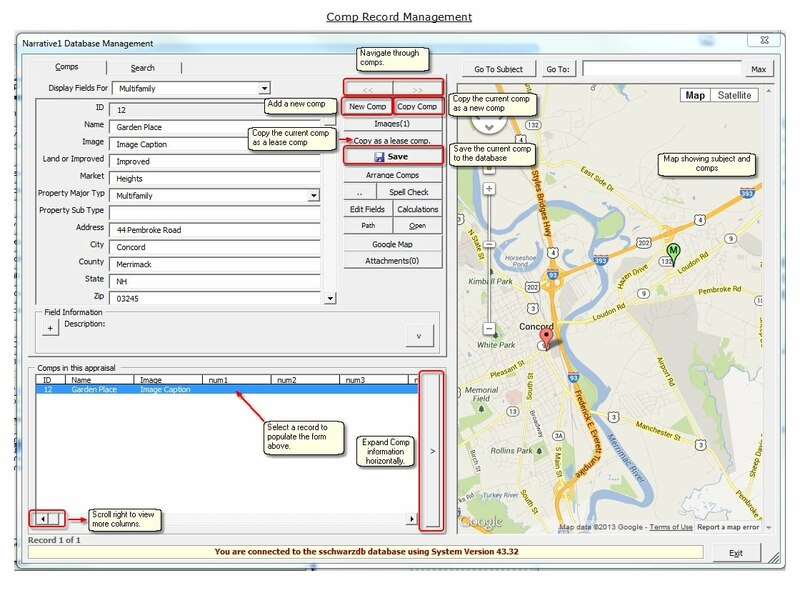 The Comp Manager can be started from any Grid (Sales, Lease, Cost, etc.) using the Manage Comps button. The Comps Manager is also accessible from the Navigation buttons at the top left corner of each table on the grid. 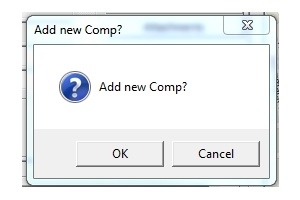 Clicking on the Comps Database button or selecting it from the drop-down brings up the Comp Manager. Shown below is the initial display with major sections highlighted. They are briefly described below. Notice two tabs: Comps and Search. The Comp Manager comes up on the Comps tab. The content of a comp record (highlighted in the lower box) is shown in the upper left box. More content can be seen be using the up/down scroll bar on the right. A map with comp and subject locations is on the right side of the display. Buttons to the right of the comp content allow the user to select functionality like Add, Copy, and Save to mention a few. The bottom section shows the list of possible comps for this report. The list is the result of a search (explained below). Not all comps in the list need to be selected for the Grid. The message at the bottom of the Comp Manager shows the database being accessed and the build number of the software. Comp records can be added, copied, updated, and deleted. To create a comp that is very similar to another comp, copy the comp. Click the Copy Comp button and the same information is displayed BUT with a new ID number. The name of the property MUST be unique, therefore this field must be entered at this time. The comp list at the bottom can be expanded by clicking on the vertical button with the ">" symbol. This expands the section horizontally to show more columns. The list may also be scrolled left and right to show more columns. To delete Comp(s)s, click on the Search tab. More detailed instructions about searching for comps are given below. The following illustration highlights the steps to delete comp(s). The comp(s) shown on the Comps Tab do not show here. The comp(s) to be deleted must first be searched for, selected, and finally deleted by clicking the Delete Selected From Database button. Start by clicking the New Comp button. The Comp Manager will display the following message. A new highlighted row is added to the list (if there is one) that is blank except for the record ID number. This ID field is preassigned by the database software and cannot be changed. The next important field to complete is the Name field. This name must be unique within the comps database. The subsequent blank fields are completed with relevant Comp information. Fill in what is known; fields can be edited/updated at a later date to complete the comp record. Comp records are made up of fields. Fields are grouped into views. If a particular field is not found, perhaps it is part of another view. Use the drop-down box called "Display Fields For" to select another view. Please note that the views can be modified to include/exclude fields at user discretion. Views may also be added and deleted. Comp content can be modified (updated) from the Comps tab. Comps that are available for modification/update are those shown in the list at the bottom of the Comps manager. (The list is created when a Search is done and Comps are selected. Search details are below.) Click the row of the comp to be edited. Scroll down to the field that needs updating and enter the new value. Some fields have drop-down boxes from which the field's value is selected. Other fields require numeric or text data. Finally, some fields are calculated using the calculator option of the Comps Manager. Please remember to Save the comp record before moving to the next or before closing the comp manager. Otherwise, the changes will not be updated in the database. If a comp field appears to be "missing", it may not be part of the VIEW. Simply select the appropriate view from the drop-down box under the Comps tab labeled as "Display Fields For". The General view usually includes most if not all comp fields. Note: Views may be changed (new view name as well as adding new views). The fields that belong or do not belong to a view may be changed. Details. Latitude and Longitude in the comp record can be updated using Google Maps. To start the Google maps feature, click on the Location Map button as shown below. 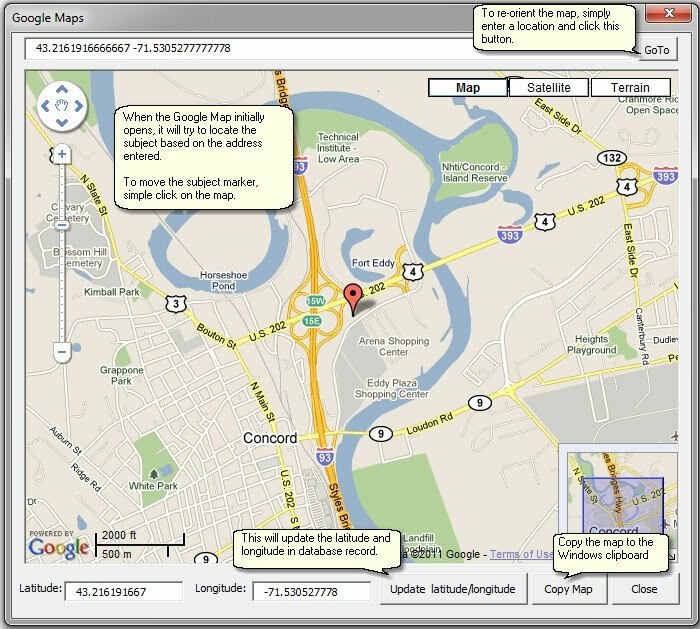 The Google Maps dialog box is displayed. Click Close to return to the Comp Manager. Enter the search criteria. (2) Some basic search fields appear on the display and can optionally be completed if the search is to be conducted on these fields. (2a) Click on the last drop-down to select a different field in the comp record. Whenever a comp field is chosen, an additional box with a drop-down to select the relational operator is shown. (2b) Select the operator. Multiple search criteria are allowed. Additional boxes are initially not shown and appear as search criteria are built. Additionally, comps may be searched by distance from subject. (2f) The distance is "selected" by moving the slider. Distance search is optional. The results of the search will be shown in the Search Results section of the display. Add file attachments to comparable records. The Google Map button will open a map window showing the subject's location and latitude and longitude. Initially, this is based on the address entered in the Comp Manager form. The map can be re-oriented by entering a new location and clicking the "Go To" button, or simply by clicking and dragging the map. To move the subject market, click on the map. Once the subject's location is defined, click the "Update latitude/longitude" button to update the comp record. Another feature is the "Copy Map" function, which copies the map to the Windows Clipboard. 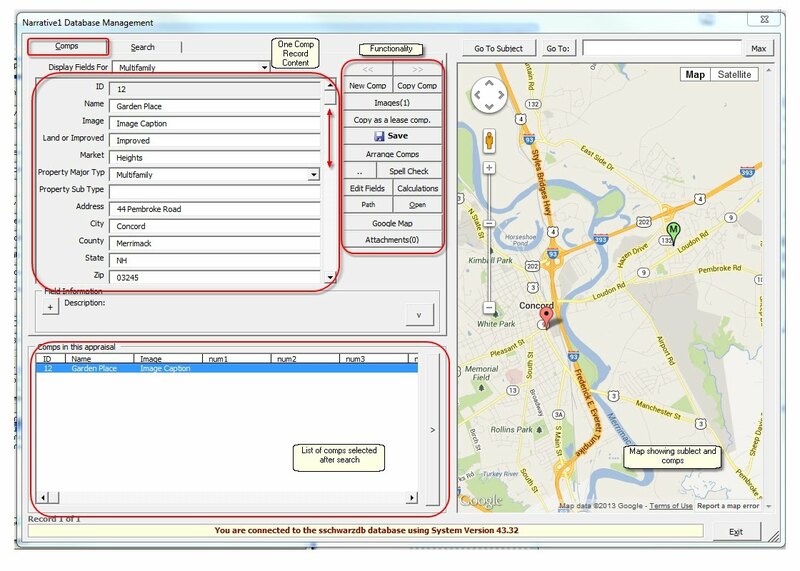 This could be used, for example, in conjunction with an image with the Comp Image Collage utility to create a comp image and map mash-up. There are two search tabs "Search" and "Map Search". Use the Search tab for to search by database field, use Map Search to search by geographic area. Select a field in the left hand column. Select the search operator in the middle column. Enter search text/value/date in the right hand column. Click Search (upper right) to conduct the search. Narrative1 now has a geographic search tool: Map Search. 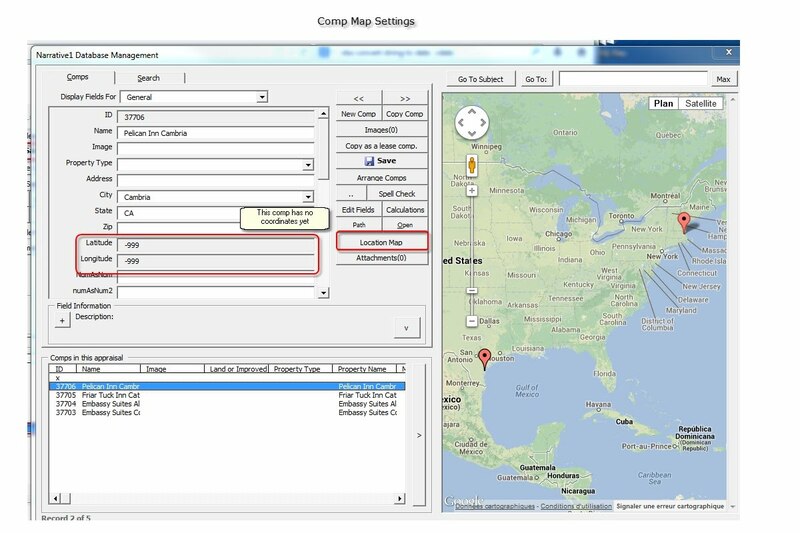 This tool will display comps that are within the map shown on the Comp Manager. 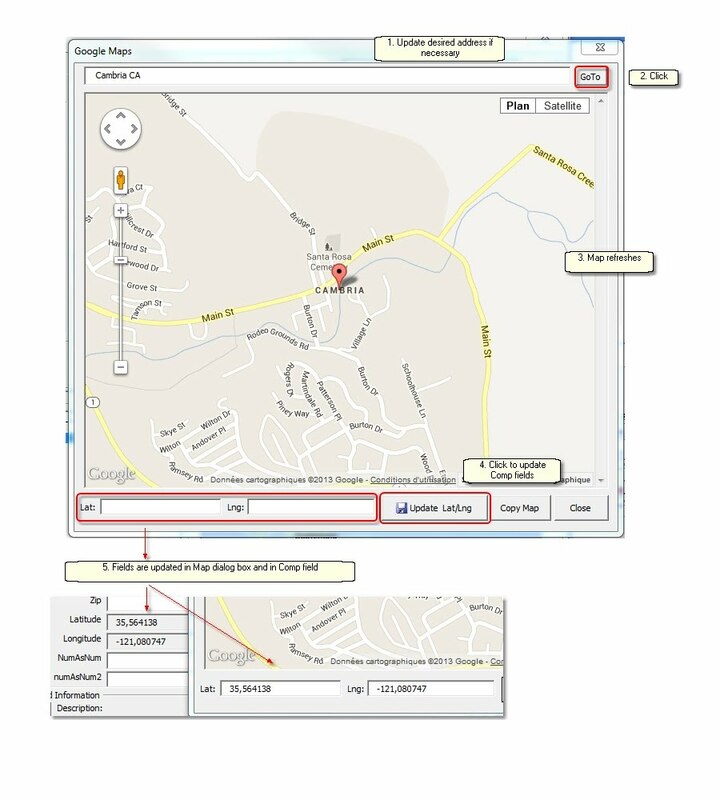 Simply use the GoTo button to zoom to a location (or the zoom tool on the map), then click Search to display comps within that area. Note the search can be further refined with database fields. Type a name in this box to save a search. Saved searches remember the map location and zoom level. Use GoTo to zoom to a location. Works with zip code, city, county, state. latitude, longitude, place name, etc. 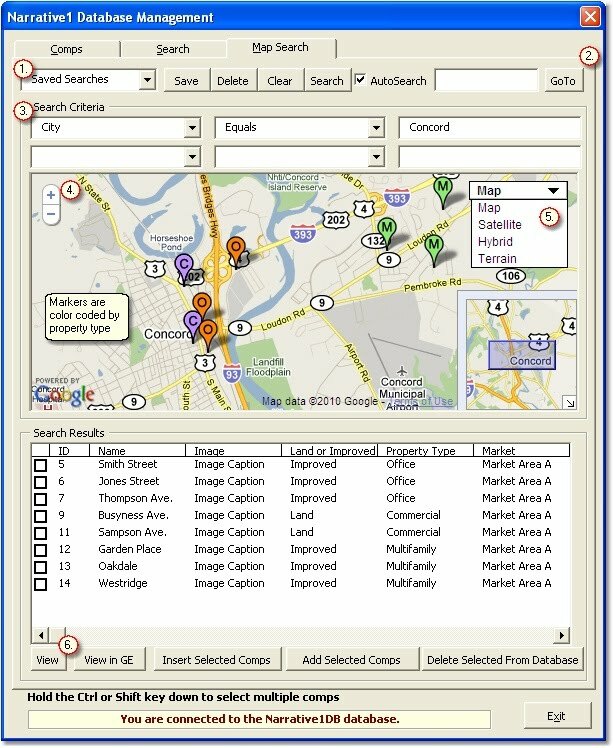 Filter and refine map search results with database field criteria. View a complete summary of the selected comparable. To get the ID, simply hover the cursor over the map pin. Click Insert Comps to replace existing comps with the selected comps. Click Add Comps to append selected comps to the comps already in the file. To save a search, enter a name in the Saved Searches box, then click Save This Search. Note: Comps are assigned to a specific comp number (1 through 10) at the top of the adjustment grid. See Populating Adjustment Grid Comps and Comp Sheets below. 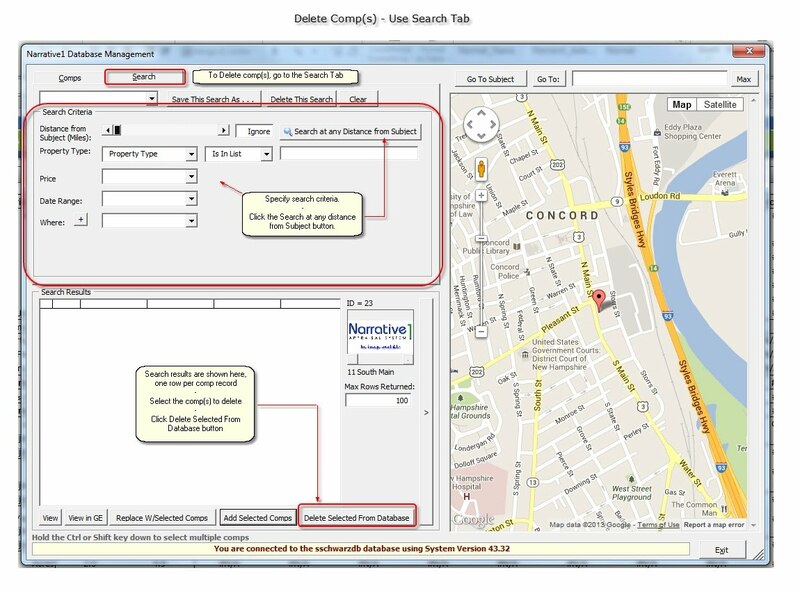 The first step is to search and select comps for analysis via the Comps manager tool, described above. Enter comps from any N1Appraisal work file or template. If the file was opened for the sole purpose of adding or editing comps to the database, it can be discarded after the comps are saved to the database. Be safe! Make sure the comps entered show up when you search before you discard the file. Click the "New" button at the right side of the form and enter the comp data. Only enter data for applicable fields - ignore fields that no apply. Add images by clicking the "Img" button. Browse to and select the image for the comparable. Save this comp to the database by clicking the "Save to DB" button. 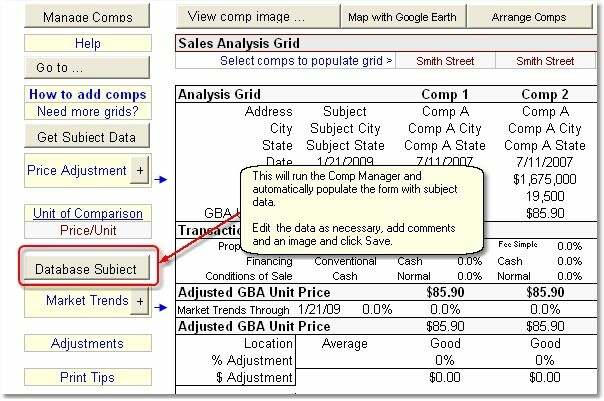 Search, select and load (insert or append) the comp to a worksheet. Edit and click the "Save to DB" button. If the comparable has been selected for analysis, edits made will flow to the grid and comps sheets automatically. 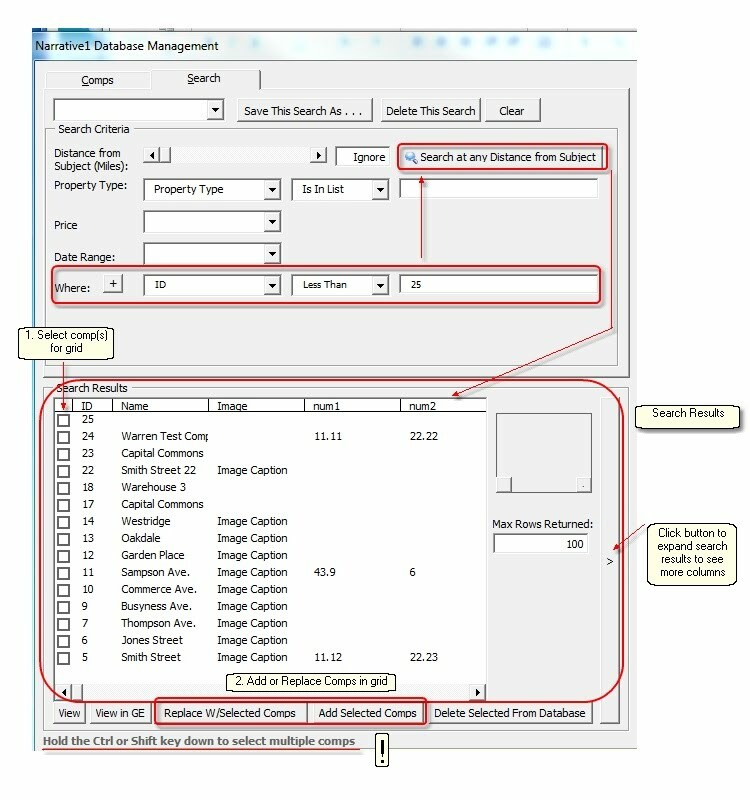 To remove a comp from a grid, use the Arrange Comps tool. Perform math operations for any two numeric fields, or a numeric field and numeric value (for example, "Acres x 43,560"). Select the field to calculate and click the Calculations button (lower right side of Comp Manager form). 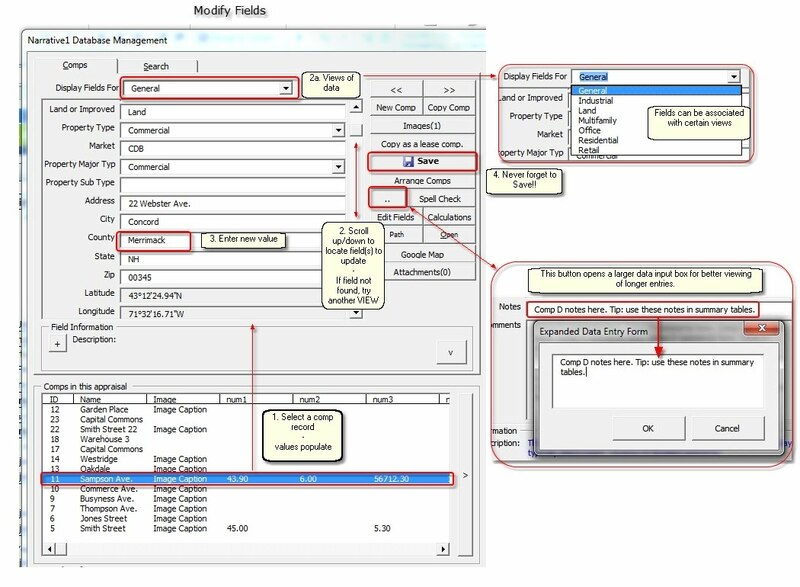 In the Calculation form, select the fields and math operation to perform with the two fields. Or, select a numeric field and enter numeric value (as depicted above). In the example below, the cursor was in the Price Per SF field when the Calculations button was clicked - this is the field the calculation result will populate. Next, the Price and GBA fields were selected, and divide (/) for the math operation. The result has been formatted as currency with 2 decimals ($#.##). Paste the calculated result to the active field. (Optional) Save the calculation. The calculation settings (fields, operator, formatting) will automatically populate when the Calculation tool is activated. 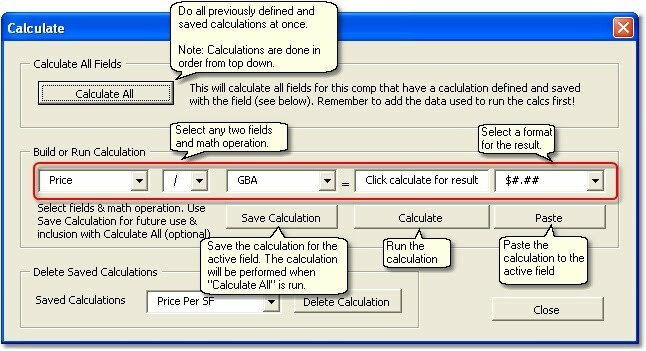 Further, all saved calculations will be performed when when the Calculate All function is run. Note: If a field value changes, (for example, Price) the calculations need to be re-calculated. This is easily done with the Calculate All function. Simply select the calculation from the list and select click Delete Calculation. The subject can be saved to the database as a appraisal record, even if it is not a sale, option or listing. However, if the subject is a transaction, be sure to select the type of transaction on the Contracts and History sheet. That setting dictates the transaction data to be saved with the database record. Start by clicking the "Database The Subject" button. This opens the database form; edit and augment the data data as necessary and save the comp. 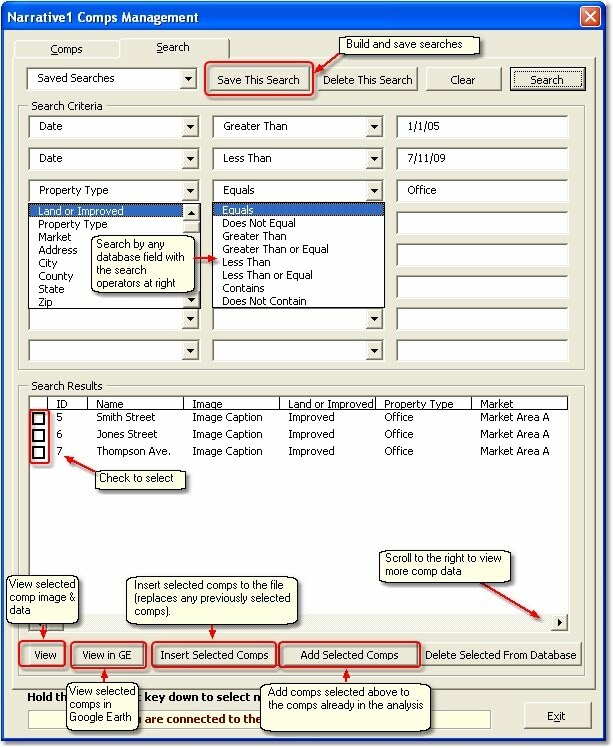 Search the database to see what has been appraised, when and where, what the value conclusion was and what the file number is. Helpful snapshot information about the property is available, such as expense ratios, cap rates, etc. This useful for larger appraisal firms, allowing associates to easily find similar appraisals to their subject. Note: When the subject record or comparable is saved, any field name that includes "Appraised" or "Appraisal" is identified by the software as confidential appraisal information. This data can omitted from search results when sharing data with other appraisers via Google Earth, as described here. Older N1 builds can easily be modified so the subject can be saved as a database record. Add, or modify the Transaction Type field to include "Appraisal". Next, add database fields for Appraisal File, Appraised Value and Appraisal Date (see Manage Fields below). 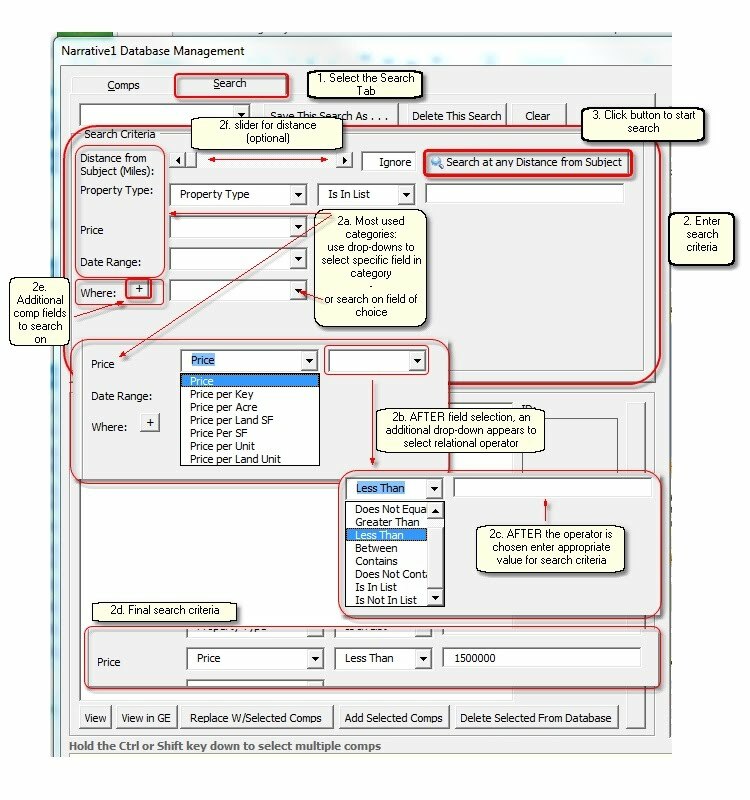 Important: Database field management must be done from the Sales Grid or the Lease Grid. Click the "Edit Fields" button to run the Edit Fields dialog. Add a new field by typing the name in the upper right text box, then click the "Insert Before" button to place the field in the field list. Important: Do not use special characters like "@", "&", "\", "%", "#", "-", etc. Remove a field with the "Remove Field" button. All comp data previously saved for this field is permanently deleted. The Format button [..] will run Excel's format dialog. Click Add Field List to add a list to a database field. Be sure to click Save after the list is created. As Narrative1 evolves we add new fields to our database. To automatically update your database with the latest Narrative1 database fields, click Edit Fields from the Comps Manager, then click the Check for fields button at the bottom (screen shot above). If there are new Narrative1 database fields not in your database, they will be listed along with a description of what the fields is for and an option to add the field(s) to your database. Click this link for a list of Default Database Fields. This feature simply provides a filter for the database fields that are displayed in the Comps Manager. 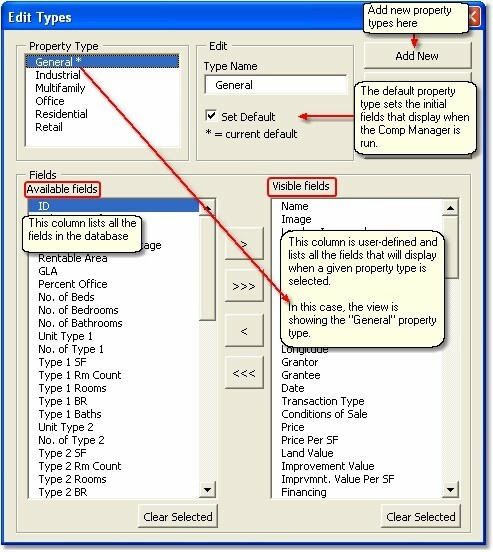 To use this tool, open the Comps Manager, click on Edit Fields, then click on Edit Property Type. 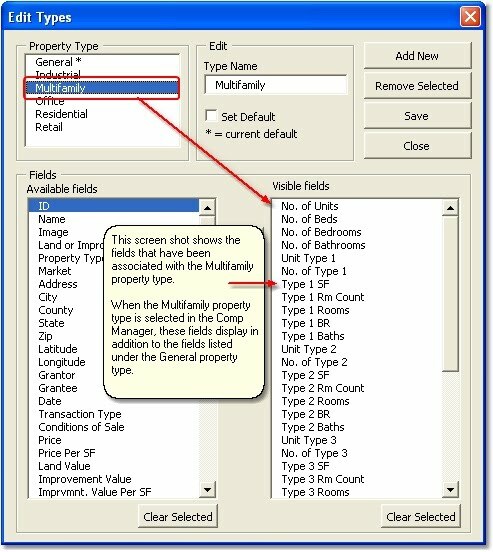 Another view of the property types dialog, this one showing the fields listed under the Multifamily property type. This utility will upload data from an Excel file to the Narrative1 Database. This is a powerful tool for moving databases to the Narrative1 system, as well as routinely uploading comp data from numerous data sources. Since many data services export to Excel, the data mapping can be saved for future imports. The Excel file should be formatted as a "flat file", meaning the top row should be data headers, and each row under the header should be a comp record. 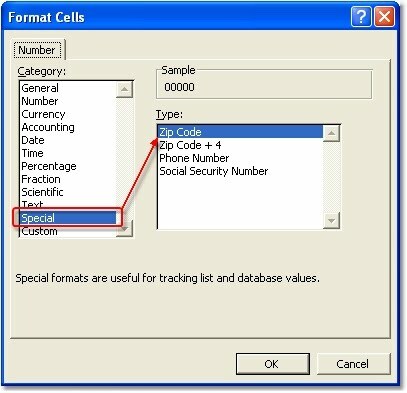 Be sure the Excel file does not have blank rows or any cells with errors, if there are calculations on the worksheet. Fields with numeric and date values should be free of text. For example, GBA should have only number, such as "65,000", not "65,000 sf". The data must be on the first worksheet in the Workbook. Below is a sample of a "flat" excel file. Start by selecting an Excel file - simply browse to and select the file. Next, select Sales DB, Lease DB or Contacts DB for the destination. This action will populate the right hand column with fields from the selected Narrative1 database. The fields in left hand column each have a drop-down list with a list of database fields from the Excel file. Match the data, as close as possible, to the Narrative1 field in the right hand column. Repeat this for all the fields and save the map for future use, if you will upload this type of Excel file again. Fields that are not mapped are listed prior to saving. The final step is to upload the data. 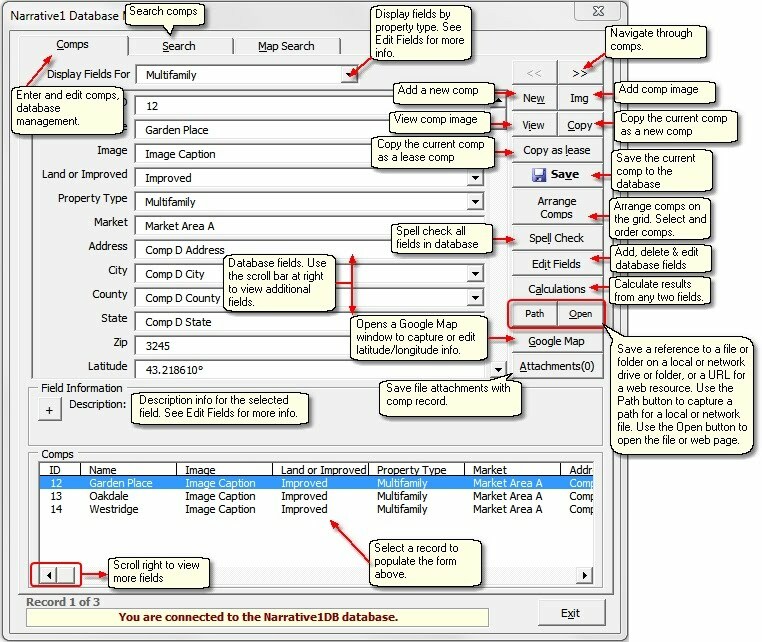 Fields that are not mapped are listed prior to uploading the data. 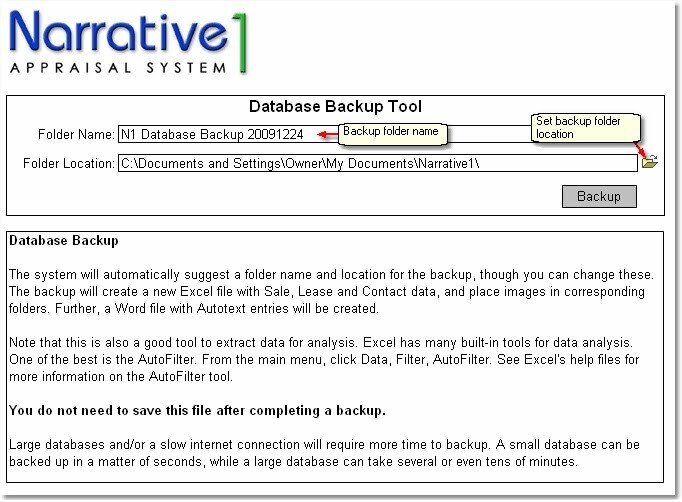 The database can be backed-up to a local drive at any time. With large databases, this can take a long time. (FYI, we back up your database every day to two separate locations). 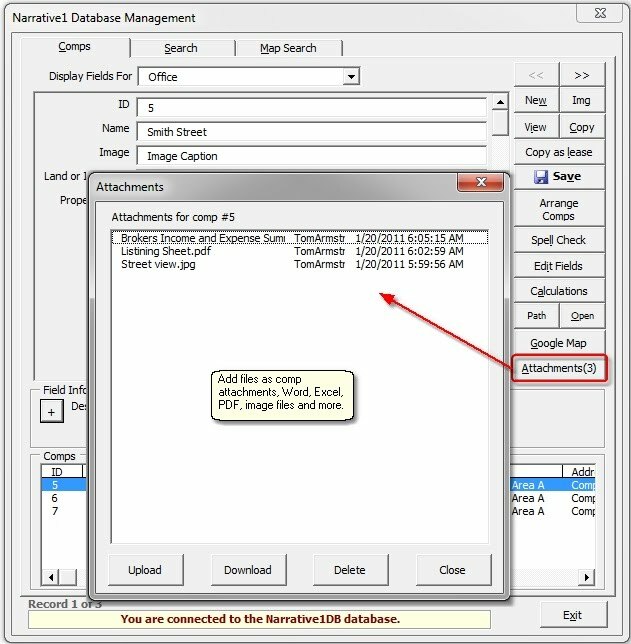 While the Narrative1 database system a SQL database, this backup utility downloads the data to formats that allow for easy data access. The Comparables and Contacts databases are download as Excel files, images are downloaded to a folder and autotext is downloaded as a Word file. This is also a good tool to extract data for analysis. Excel has many built-in tools for data analysis. One of the best is the AutoFilter. From the main menu, click Data, Filter, AutoFilter. 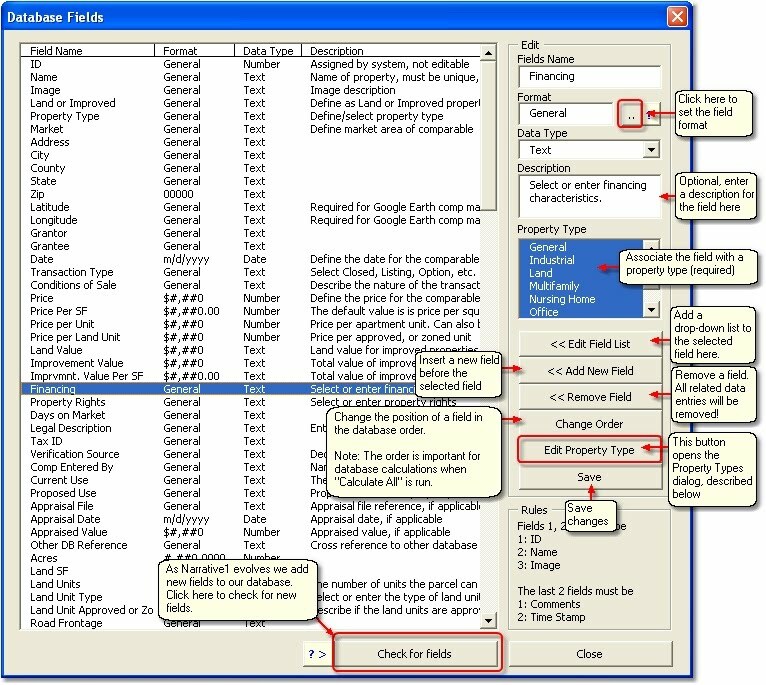 See Excel's help files for more information on the AutoFilter tool.